Mr Joe Bartley got more than he bargained for when he placed an advertisement in his local paper looking for employment. He not only received interviews and job offers but international attention too. 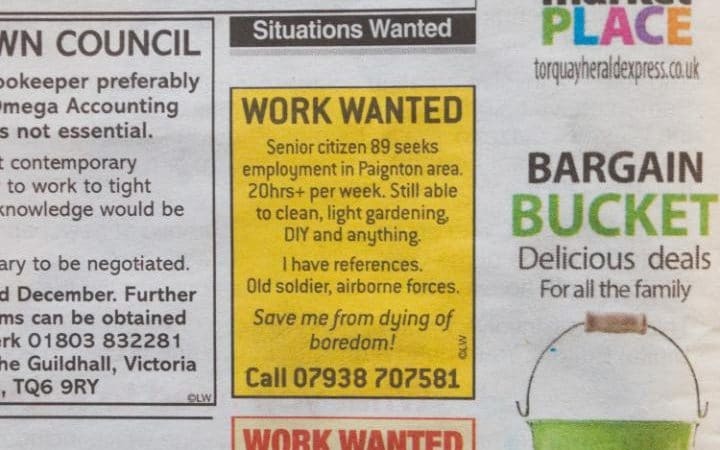 The advert read "Senior Citizen 89 seeks employment in Paignton area. 20 hours plus per week. Still able to clean, light gardening, DIY, anything. I have references. Old solider, airbourne forces. Save me from dying of boredom!" Mr Bartley was driven to place the advert having found himself incredibly lonely since his wife, Cassandra, died two years ago. He said of life without her "Since she died, I've moved into a flat and it's a big block. Once you walk into that flat it's like solitary confinement." He continued "I am now seeking employment to save me for the boredom of living in my flat on my own." This story comes at a time when Age UK are launching their Christmas campaign to highlight the impact of loneliness on older people. Their campaign films feature two well-known actors, James Bolam and Miriam Margolyes, and are based on the real life stories of individuals who describe the loneliness they feel in their everyday lives. The aim is to get people to support their pledge to help tackle the loneliness that is "blighting the lives of far too many older people." Whilst this message is released at Christmas it's relevant all year round with a reported 1.2 million older people in England saying they are chronically lonely. Unfortunatey this isn't a new story. The impact of loneliness on mental and physical health in older people has been documented for years. What we need is greater awareness of the situation and the devastating impact it can have. There are simple remedies but it requires us all to take a little bit of ownership, whether that's taking the time to engage with a neighbour or relative, or for local businesses to promote the benefits of employing older people. Both Age UK's poignant films and Mr Bartley's story have certainly helped to raise, much needed, awareness of the impact of loneliness. For me Mr Bartley's story is particularly heart-warming, and important, as it deomonstrates the overwhelming support for one individual's request for help. Mr Bartley is now an employee of a local cafe and is spending his days charming customers, helping with food preparation and making drinks. He receives fan mail and has been inundated with supportive messages on the cafe's Facebook page. Let's hope that Mr Bartley's story continues to have a positive impact and loneliness remains in the spotlight - for all the right reasons.